In August, U.S. officials reportedly pressed the European Union for a quick trade deal. Negotiations over TTIP — the Transatlantic Trade and Investment Partnership — had come to a halt in 2017. Now, after imposing a series of trade sanctions on the E.U., President Trump appears to have changed his mind, and an E.U. agreement is back on the agenda. The big question is whether political elites can now push an agreement forward. Popular opposition in Europe suggests that any future trade negotiations between the two sides will not be easy. Many analysts claimed that it was mainly anti-trade “populists” and nationalists who campaigned against TTIP in Europe. But European opposition to TTIP was in fact diverse and cross-sectional. Nationalist parties on the radical right criticized TTIP — but so did radical left and Green (often strongly pro-E.U.) NGOs and parties, together with sections of the democratic socialist parties in many countries, most notably Germany. This suggests that a simple choice between “protectionism” and “free trade” fails to capture the nuances of the European debate on trade. Even if the TTIP talks had not been discontinued last year, the vote on the deal by the European Parliament would have been contested. And had TTIP been designated a “mixed agreement” similar to CETA (the Comprehensive Economic and Trade Agreement with Canada), it would have required ratification by each European member state, increasing the odds for political standoffs. At the end of July 2018, during a much-anticipated meeting between Trump and European Commission President Jean Claude Juncker, the E.U. managed to avert the U.S. tariffs on autos and auto parts in exchange for boosting purchases of U.S. soybeans and building terminals to import U.S. liquefied natural gas. Some observers called out the “art of no deal” — Politico noted that “the EU offered what it was already going to do. And in exchange, the U.S. agreed not to do what it hasn’t done yet.” But now Washington is pressing the E.U. to offer more substantive proposals. European leaders remain wary. French President Emmanuel Macron claimed he is “not in favor” of a TTIP-style deal with the United States, as “no European standard should be suppressed or lowered in the areas of the environment, health or food.” Macron, often labeled a neoliberal, and far from protectionist in his views, shows a good understanding of public opinion within the European Union. Making E.U. trade policy more democratic? The European Union has made a consistent push to democratize international trade as part of foreign relations, giving more power to the European Parliament. With the adoption of the Lisbon treaty, the European Parliament is now required to give consent to trade agreements and should be regularly updated on progress during negotiations. European citizens have also used direct democratic mechanisms such as the European Citizen Initiative to influence trade negotiations with the United States and Canada. In 2014, the European Commission refused — with no legitimate reason — to register the initiative, but more than 3 million E.U. citizens signed the petition against TTIP and CETA, expressing concerns about the secrecy of the negotiations, the threat to European standards and the extension of corporate power through the Investor-State Dispute Settlement mechanism. The petition was finally officially registered in 2017 with more than 1.2 million signatures collected in the following year. 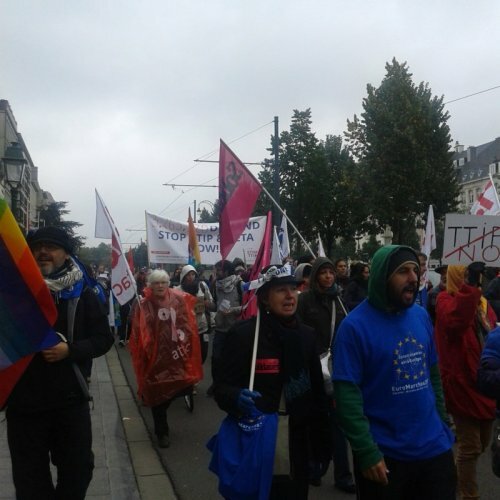 And hundreds of thousands of people marched through the streets of Berlin, Madrid, Barcelona, and other European cities to oppose TTIP and CETA in 2015 and 2016. The media described critics of TTIP in the E.U. — and Germany in particular — as “protectionists and scaremongers.” But those who opposed TTIP in Europe and their reasons to protest were a far more diverse group. Opposition to TTIP was not initially a radical right issue in European countries like Germany, Bulgaria and the United Kingdom. Germany’s radical right party Alternative für Deutschland (AfD) switched its position on TTIP in the middle of the 2014 European elections campaign, despite having originally supported the agreement. Later on, AfD tried to join anti-TTIP marches organized by Stop TTIP coalition but the party was rejected. Similarly, in the United Kingdom, the far right UKIP was originally undecided — and opposed TTIP in 2014 only after a series of media misunderstandings. UKIP’s stance was that the agreement was not “free enough” — but would allow “giant corporates to dominate.” Instead, UKIP claimed the United Kingdom — once it exits from the European Union — can negotiate a “freer” agreement with the United States. In Austria, the radical right Freedom Party clearly opposed TTIP and CETA, but this was one of the issues sacrificed during coalition negotiations with the center-right People’s Party, led by Sebastian Kurz. In many countries, radical right parties opposed TTIP and CETA under pressure from their bases in a rather opportunistic and situational way. This is why they simply “borrowed” Green/left arguments, reframed to focus on national sovereignty. A notable exception is Italy, where both the radical right Lega Nord and the catch-all Five Star Movement — currently governing in a coalition together — remained firmly opposed to TTIP and CETA. The wide range of opponents proposed very different alternatives to TIPP. Instead of “freer agreements” or protectionism — options proposed by radical right actors in different contexts — radical left and Green actors suggested an alternative trade mandate that supported fairer and democratically negotiated free trade agreements that promote labor and environmental standards. In the United Kingdom, for instance, opponents of TTIP were afraid it might pave the way for a future privatization of the National Health Service. In Italy, the Lega and the Five Star Movement wanted to protect food sovereignty and small and medium-sized enterprises. In Germany, activists were fighting to protect European rather than national environmental, food and labor standards. The bottom line is that any new agreement between the European Union and the United States would either be much more limited or seems bound to encounter serious opposition within the European Union. If the past TTIP concerns and protests are a guide, Europeans are not against the concept of free trade — but would not be satisfied with free trade as it is currently being done. What they would want instead is a more democratic and just trade policy, corresponding to the myth of a green, social and humanitarian Europe promoted by the E.U. Commission itself. Julia Rone recently defended her PhD at the European University Institute at Florence and is currently a visiting fellow at the Weizenbaum Institute in Berlin and part time lecturer at Sofia University. Her research interests include contentious politics, digital media and the diffusion of ideas. Find her on Twitter @JuliRone.